From blockchain to the Internet-of-Things (IoT), technology advancements are slowly changing the way we do business in the equipment rental industry. More information is available than ever before. IoT solutions help you gain insight into your data, make better decisions and detect problems before they arise. Thanks to the increasing number of cloud devices, you can access real time anywhere and at any time. Innius is a cloud-based platform that makes connections to devices like machines, cranes, and other mobile devices. When a collection is established, data can be drawn and streamed to the platform. The data can be enriched so you can view the workings of the machine. Based on that information, operators’ mobile devices can be triggered to warn them when thresholds have been reached. The device might require maintenance, or it might need certain parts or to prevent breakdowns. 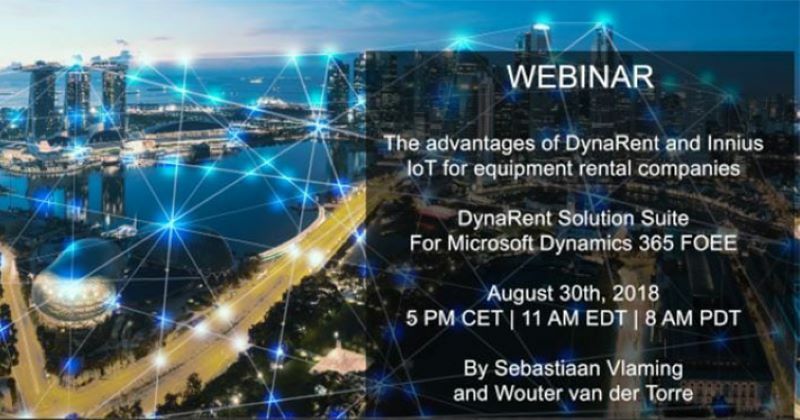 Innius provides reporting and insight on the machine’s condition, but it can also trigger events in other applications like DynaRent. For example, when a crane needs maintenance, it will automatically create a work order in DynaRent so that the engineer can start working on it. When a particular device connects to the Innius platform it gives you immediate insight into several KPIs, for example, the mean time to repair, overall equipment effectiveness, or the energy efficiency. These are all out-of-the-box functionalities. All the data will stream to the Innius platform and you will be able to view it in the application in real time, in contrast to some other applications that first gather the data and then run reports on it. You can stream the data to a mobile device or share with other collaborators. Say you have a question about one of your devices that you don’t know how to fix. If you share the data with the manufacturer, for example, they are more likely to be able to help you if they also have access to the data. Innius also offers a way to improve your customer responsiveness and service levels with ongoing improvements of your engineering design and machine performance, avoiding the cost and effort of data-analytics and machine-learning initiatives. You can apply the solution’s standard KPIs or create your own, and easily integrate it with other DynaRent and data sources. We have several examples of how Innius links to a device in DynaRent. During the webinar, we will provide an example on how to use the IoT framework for cranes. If you would like more examples, please contact us and we’ll prepare a demonstration tailored to your line of business. If you’d like to learn what Innius can do for your company, join our webinar on August 30th! We hope you’ll mark your calendar and register today. We look forward to meeting you on August 30th! If you cannot make the initial webinar, please feel free to watch it (after August 30th by visiting our Webinar on demand section on our website. In this section you will also be able to find many more (previous) webinars and product videos.